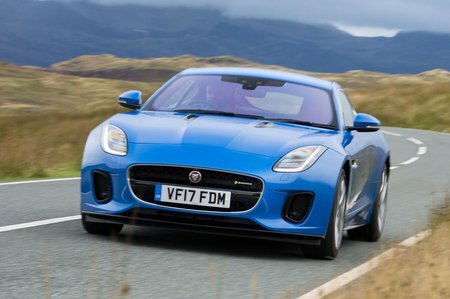 Jaguar F-Type 3.0 Supercharged V6 2dr 2019 Review | What Car? What Car? will save you at least £4,602, but our approved dealers could save you even more. This entry-level trim comes with xenon headlights, single-zone climate control, satellite-navigation, Bluetooth, a DAB radio, part-electric seats and rear parking sensors as standard. That’s a reasonable amount for the money, but there’s a lot on the options list that is worth considering. We’d recommend the performance seats (including full-leather upholstery), dual-zone climate control, heated seats, front parking sensors, premium leather interior and, if you go for the automatic gearbox, aluminium gearshift paddles. On V6 models, the sports exhaust livens up the sound track, but it does little to improve the 2.0-litre engine’s noise. This 335bhp V6 engine can get the car from 0-60mph in around five seconds and it’s significantly cheaper than the more powerful V6 380 model, so that’s why it’s our favourite. A six-speed manual gearbox or an eight-speed automatic are available, but make sure you spec the optional switchable sports exhaust if you choose this engine.